The Government has issued Resolution 104/NQ-CP on streamlining administrative procedures and citizens’ documents related to resident management in the jurisdiction of the Finance Ministry. 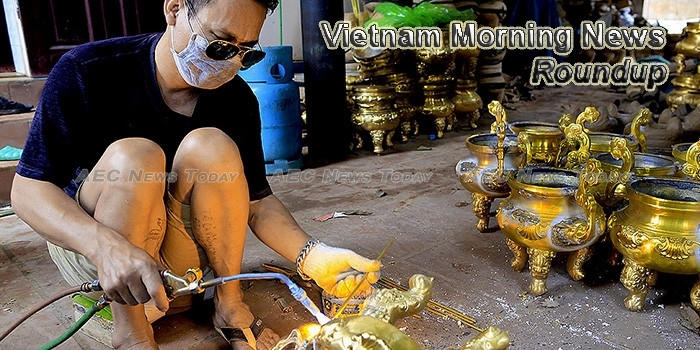 VEPR Director Nguyen Duc Thanh said that growth in the fourth quarter could reach 7.12%, building on the strong growth in the previous three months, which the General Statistics Office (GSO) reported at 7.46%. Heavy rain in northern and central Vietnam triggered floods and landslides that killed 46 people and 33 people were missing in the worst such disaster in years, the search and rescue committee said on Thursday. The city’s tourism department has been criticized for making proposals on such a ‘sensitive’ topic. The Vietnam Fruit and Vegetable Association has forecast that Vietnamese fruit and vegetable exports will rise in the near future. Việt Nam should have a long-term programme on mycological research as the country has a tropical climate, a favourable condition for developing fungi, the chairman of the Vietnam Mycological Association has said. A pepper glut in the Central Highlands as more and more farmers switched to the crop lured by the earlier high profits from the spice has caused prices to collapse and threatens to bankrupt many of them. Vietjet Air was honoured as “The pioneer airline” at the annual festival of national tourism 2017 under The Guide Awards, held by The Guide magazine of the Vietnam Economic Times, for the airline’s contributions to the development of the Vietnamese tourism industry. Any local in Hanoi or Ho Chi Minh City (the two largest cities in Vietnam) will tell you about the difficulties of getting around those places, as the roads struggle to deal with the masses of bikes, buses, and cars, the numbers of which seem to increase with each passing year. Car sales in September plummeted, according to the Vietnam Automobile Manufacturers’ Association (VAMA). The US National Oceanic and Atmospheric Administration (NOAA) has warned Vietnamese seafood processors, importers and exporters to fight against illegal, unreported and unregulated (IUU) fishing, following a new rule that takes effect next year. Bosch Vietnam, a German multinational engineering and electronics firm, will be a supplier of technology and services for VinGroup’s automobile and electrical motorbike project VINFAST. A seminar was held in Hanoi on October 12, under the theme ‘Hanoi meets British Business Group Vietnam (BBGV)’, with the aim of seeking stronger economic partnership between Vietnam’s capital city and British businesses. The functions and operations of the Vietnam Debt and Asset Trading Corporation (DATC) should be restructured to handle the “next phase” of handling non-performing loans (NPLs), the Finance Ministry (MoF) says. The Vietnam State Treasury successfully mobilised 2.1 trillion (92.5 million USD) through Government bond auctions at the Hanoi Stock Exchange (HNX) on October 11. Vietnam’s largest dairy producer Vinamilk said its advertisement on YouTube was among the top 10 most watched ads on the channel in the Asia – Pacific region from July 2016 – July 2017 recently released by Google. Sài Gòn-Hà Nội Securities Co (SHS) has displaced Saigon Securities Inc (SSI) to be the leader among the 10 brokerage firms with the highest third-quarter market share on the Hà Nội Stock Exchange (HNX). The Government has projected a GDP growth rate of 6.7% in 2017 in a report submitted to the National Assembly Standing Committee during the Committee’s 15th session in Hanoi, on October 12. The international exhibition on machine tools and metalworking solutions for production upgrade (Metalex Vietnam 2017) officially kicked off in Ho Chi Minh City on October 12. Air bag problems have forced Ford Việt Nam to recall 119 Ford Ranger and Ford Everest cars made in Việt Nam. Could Vinacapital Vietnam Opportnty (VCVOF) Skyrocket From Here? Penny stock shareholders are becoming inquisitive about Vinacapital Vietnam Opportnty (OTCMKTS:VCVOF), following the fact that the share price has moved $-0.02, reaching the $3.44 price level in a recent trade. Of the 116 projects, 64 are related to transport infrastructure, five to urban technical infrastructure, seven to flood reduction, three to agriculture, one to manufacturing, four to commerce and services, 21 to urban refurbishment and housing resettlement, six to education projects, one to health project, and four to culture and sports. After scrutiny, the ministry and provincial people’s committees put a stop to a total of 468 potential hydropower projects, the capacity of which amounts to 2,000 megawatts, said Do Duc Quan, deputy director of the General Directorate of Energy under the Ministry of Industry and Trade (MoIT).